My name is Brian Owen and I work on a product called Handibot. 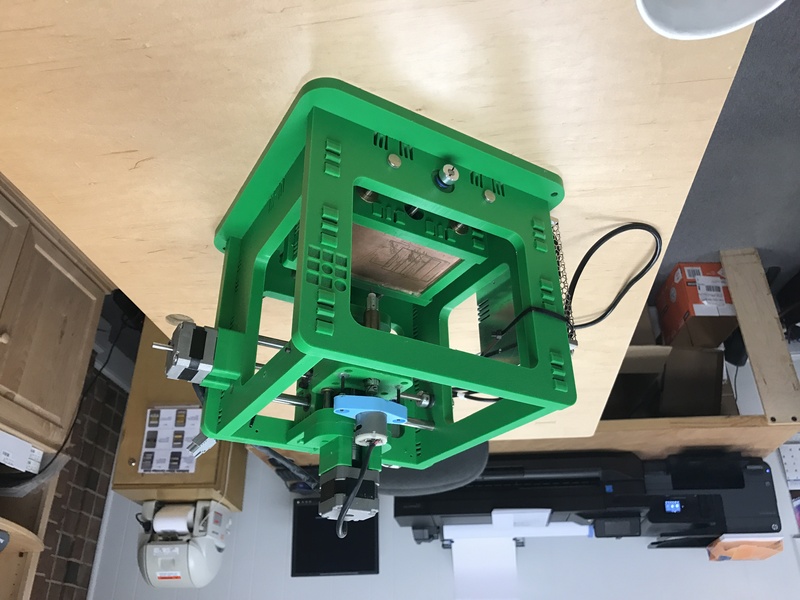 It’s a small, portable CNC router—or 3D carver—I always struggle with the fact that there isn’t a name for CNC that sounds as cool or self-explanatory as 3D printing…but we usually jump off from that concept when talking about it at maker faires—where many people’s first encounter with digital fabrication is the 3D Printer. We’ll say that 3D printing is additive fabrication—while CNC routers are subtractive. 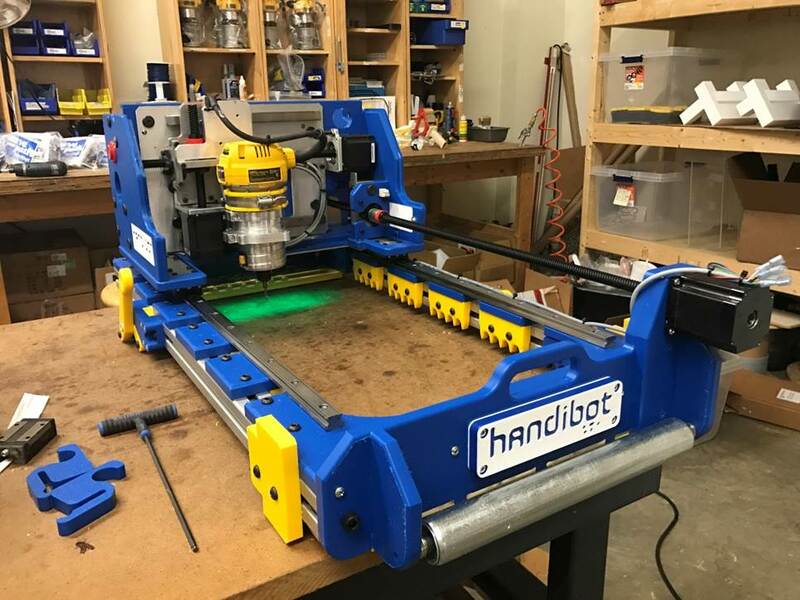 We started selling Handibot in 2014—after a successful kickstarter campaign convinced enough people at ShopBot that making a small tool was a good idea that people were interested in—ShopBot’s bread and butter are usually the large scale, full room sized, CNC tools. 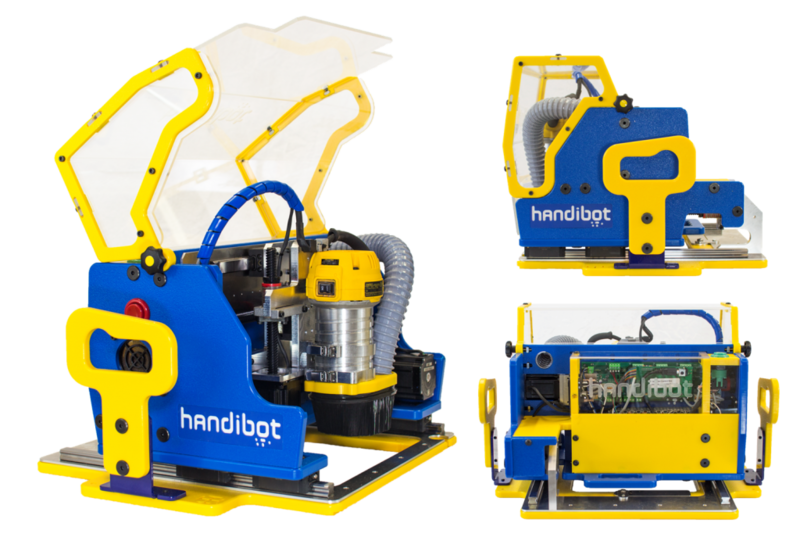 A guy named David Bryan was in charge of the project at that time (I made the lucky choice to compliment this “Handibot” thing I’d seen on the website during a phone screen for a job interview with ShopBot). 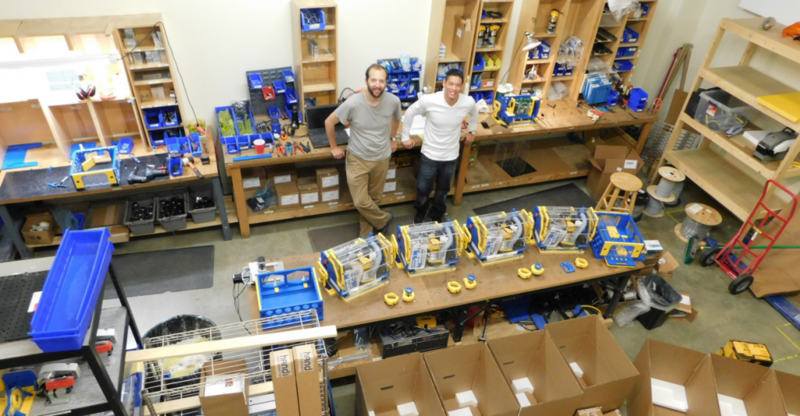 A year later, —we started to look for a new space, Handibot was growing—and so was ShopBot. 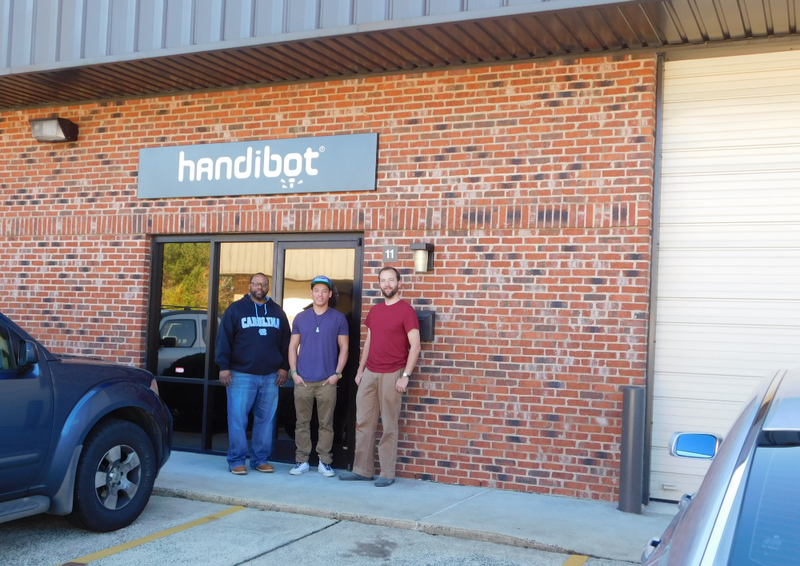 We’d started to realize that handibot was going to have a different kind of culture than a typical manufacturing operation. 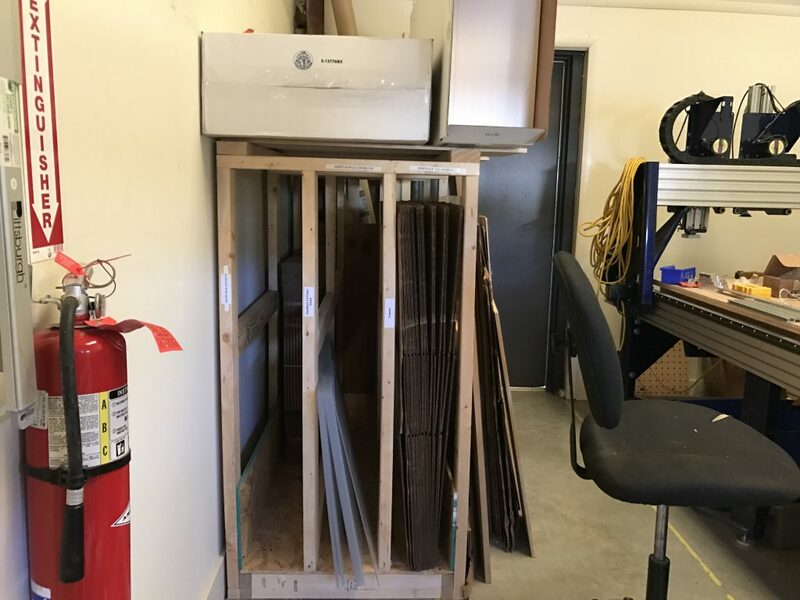 We moved ourselves a mile down the road into a small 1500sqft unit in an industrial park that we share with coffee importers, video production companies and a toy maker. Currently we employ three people; Earl, who usually builds the mechanical parts of the tools, goes to trade shows and machines many of the components of the tool; Lee, who builds the electronics of the tool, handles shipping and receiving—and a little bit of trade show travel himself; and Me—I do design on tools and accessories, try to build most of the accessories so those guys don’t have to be pulled in too many directions—and I deal with tech support and produce video tutorials and projects for our social media. What I’ve concluded after spending almost two years in our tiny factory is that the space itself—the tools we can afford, the materials we can warehouse—determine the form of the tool just as much or more than any ideas I might have. I find myself thinking more about how I can redesign a part so that we can make it in house—or assemble it using commonly available components. This reminds me of a TED talk that I heard David Byrne—the kooky lead singer of Talking Heads and interesting IDEA guy—give a few years back. 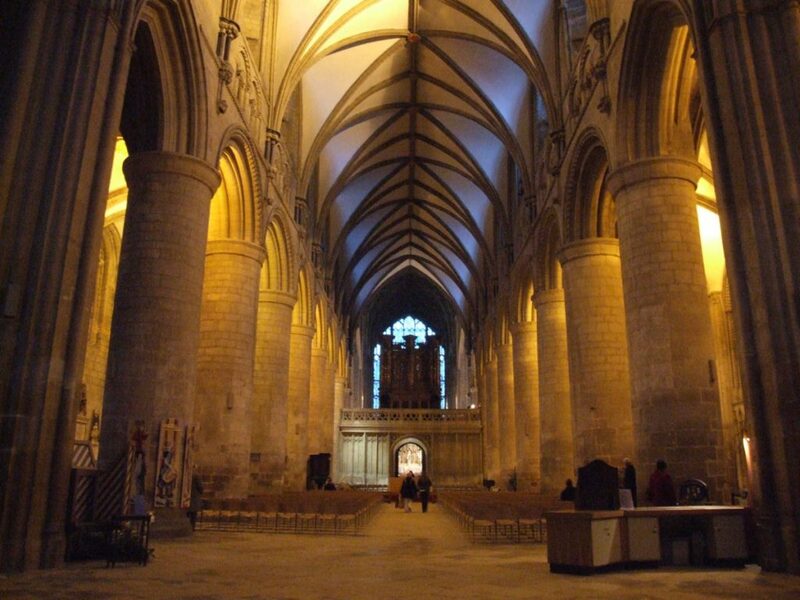 He was talking about the way that the spaces in which music was performed guided the evolution of music. 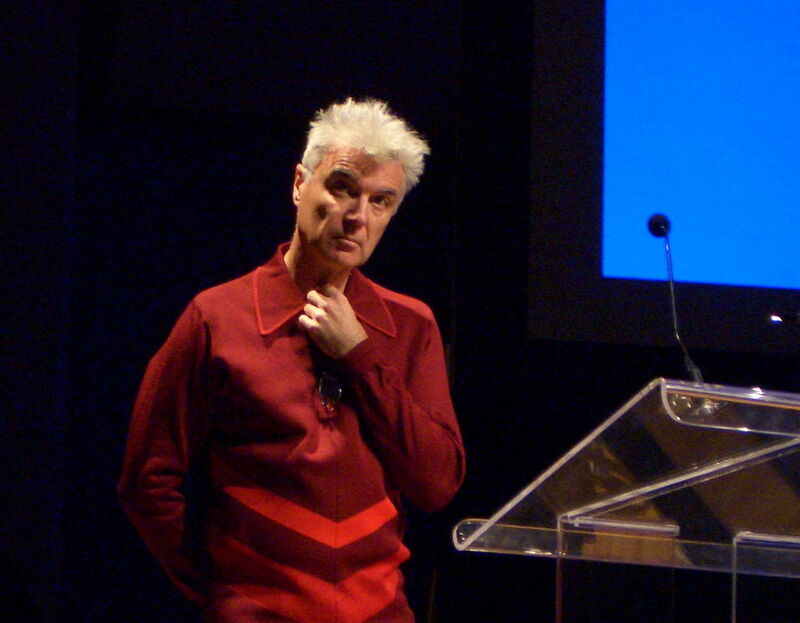 He later expanded on this idea in his book “How Music Works” which is a really fascinating study of music through the lens of his projects over the years. 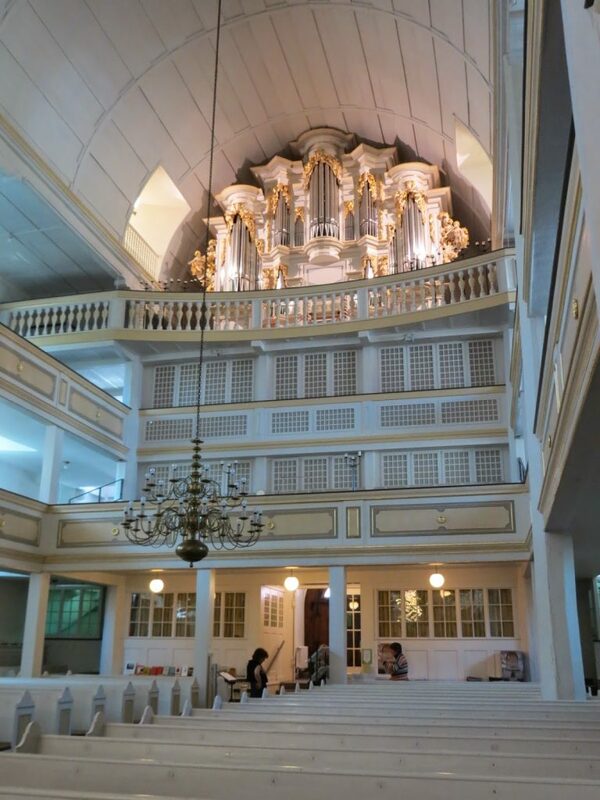 He’s talking about the way that the complex music of Bach was only made possible by the small chapels that were being built during Bach’s lifetime—in the cavernous cathedrals of previous generations, his music would have turned to a cacophonous mush–As would some of the music of Mozart outside of the halls where it was performed in Vienna. 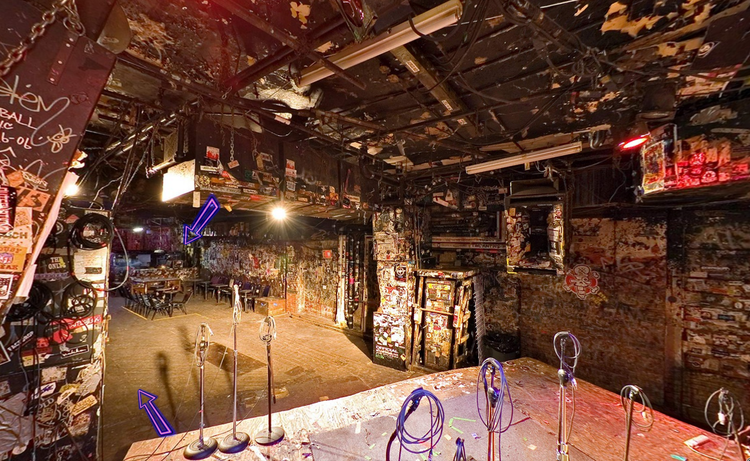 Or the place were Byrne performed his own music first—the low ceilings and crowded space at CBGB lended itself to making his clever lyrics and grooving beats understandable. 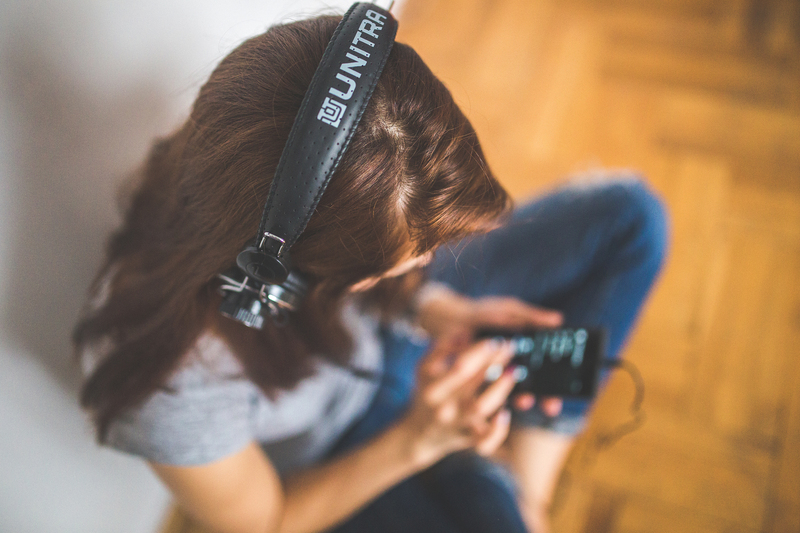 And now—I’d imagine that the most popular venue for music is the privacy of your own headphones—and it has generated a huge interest in quiet, delicate, atmospheric music. As Byrne said, the artists can whisper right into your ear. I like to imagine that the tools we use to manufacture have a similar effect on the individual products—and the overall aesthetic tastes that our culture adopts. 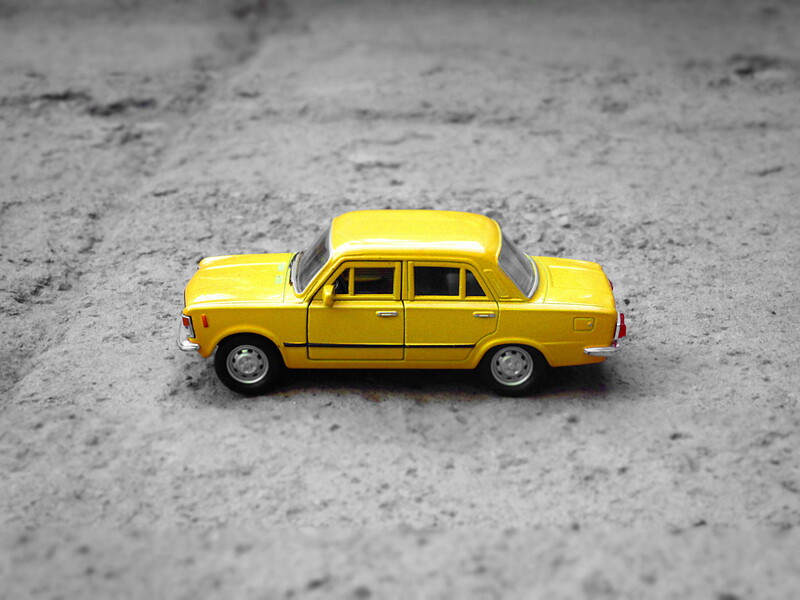 Just a few examples—die cast toys—giving way to more complicated, complex, sharp edged plastic toys as plastic molding became cheaper and easier. 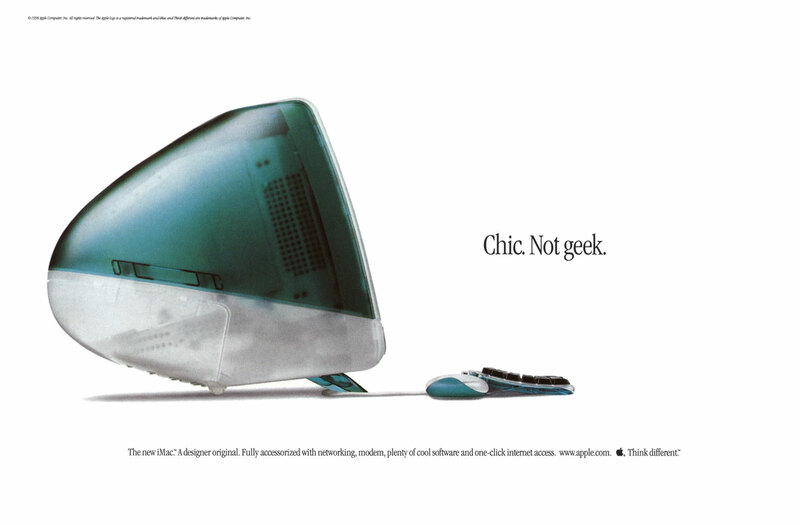 Or even continued development of the same techniques—utilitarian molded plastic computers transformed into artistic expressions—with clear panels that are meant to flaunt and obviate the methods used to manufacture them rather than disguise them under an opaque shell. As digital fabrication technology has developed, our tastes have evolved to appreciate things that tell the story of how they were made just by their appearance. 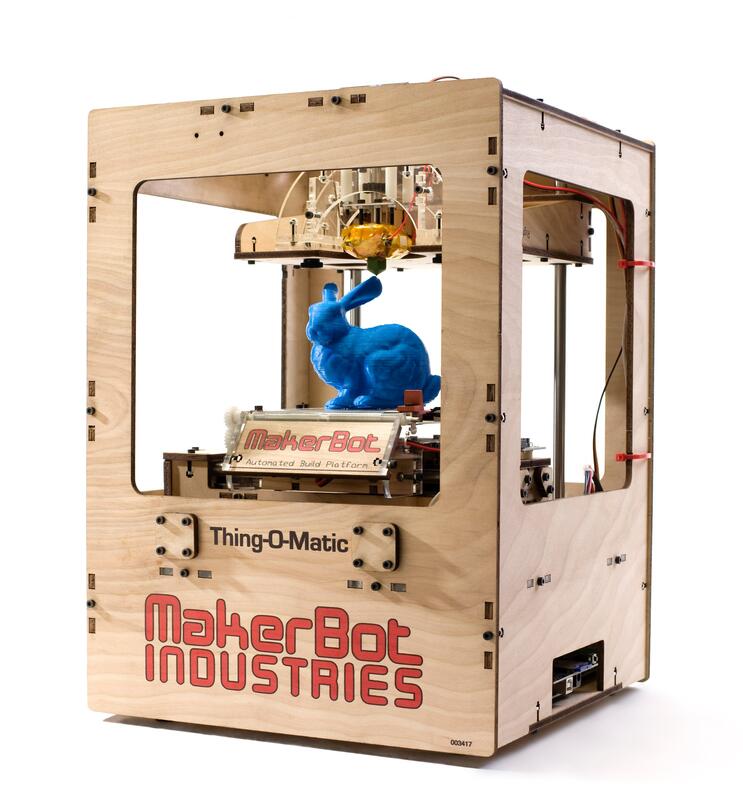 3D printers have given us impossible geometries and organic tangles. These kinds of things are seen as pieces of art just as much as products. And as the cost of the tools to produce products like this started to come down—even the tools themselves became consumer goods—attractive because they demonstrated the possibilities of the technological revolution that you were buying into when you purchased one. One of my favorites—and the eventual inspiration for the handibot—is the MTMSnap. 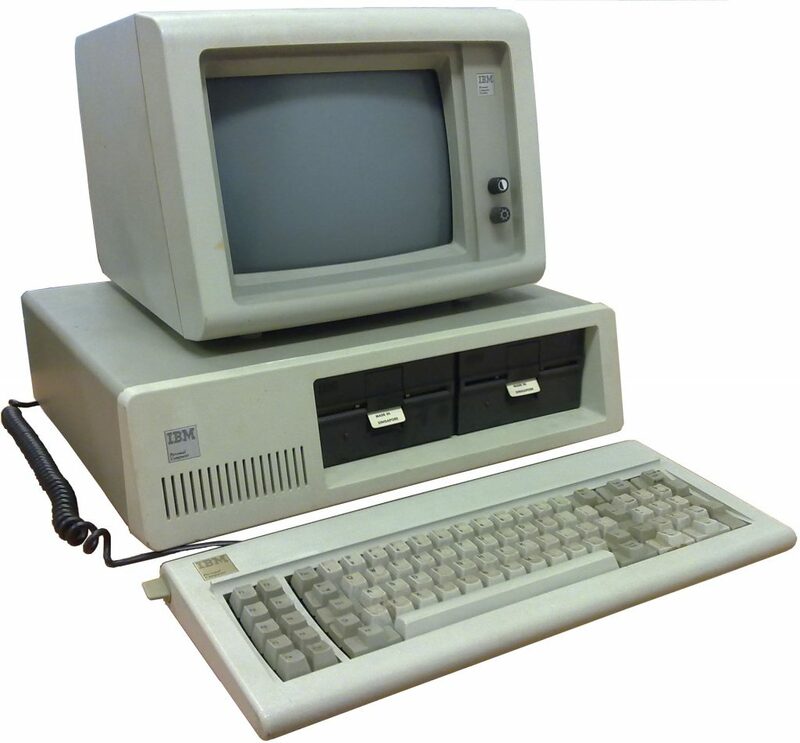 It was designed by a guy named Jonathan Ward—just down the road [from Microsoft NERD Center] at the Center for Bits and Atoms—when he was working in Neil Gershenfeld’s lab. One of Neil’s themes is tools making tools. And Jonathan’s Snapbot took this in an interesting direction with a frame that was entirely manufacturable using consumer grade digifab technology. The whole thing can be milled with a CNC router—using a 1/8” diameter router bit. He realized that by building extra complexity into his parts, he could eliminate the need for screws the hold the frame together—trading human assembly time—for machine cutting time. The joints that hold the frame of the snap bot together are flexures, cut into the HDPE parts that comprise the outer walls. They snap together kind of like the plastic clasp on your bookbag strap. Ward also realized the inherent limitations in the technology that he was using to build his tool. 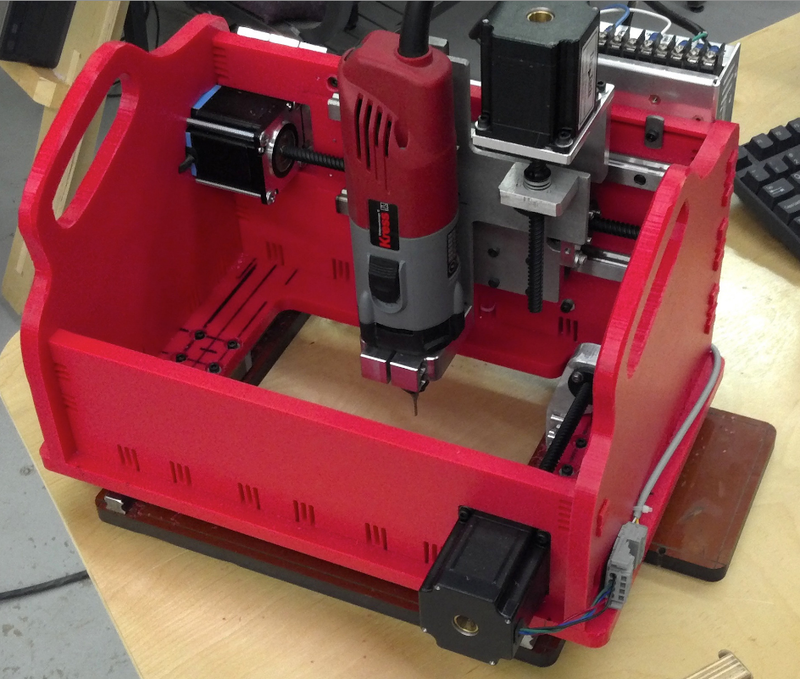 He wanted to make a tool that could mill out precise circuit board designs. How could that be achieved, making the parts with a larger tool that probably had lower resolution than his eventual target for his product? He decided to work with the shortcomings of the material and the tool—rather than against them. 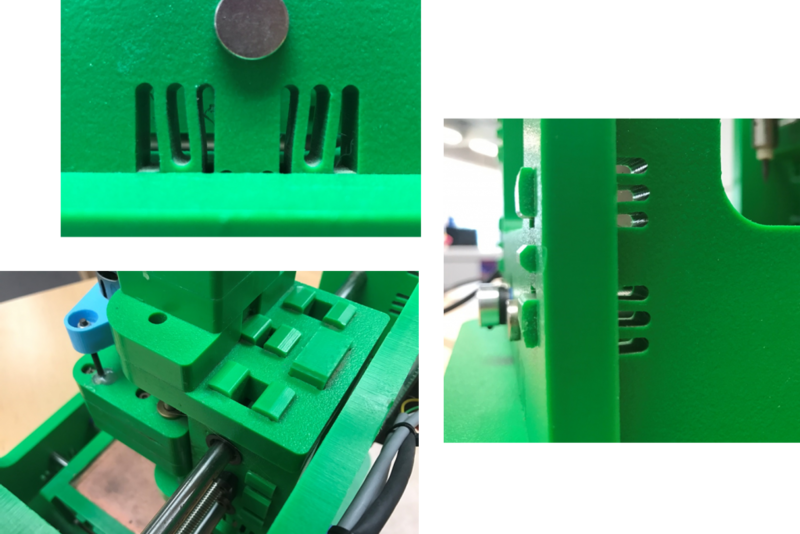 The shafts that drive the platform back and forth were mounted it similarly flexible couplings machined into the plastic wall of the tool—letting them shift into the lowest stress position to prevent binding in the drive system that would sap accuracy from the tool. 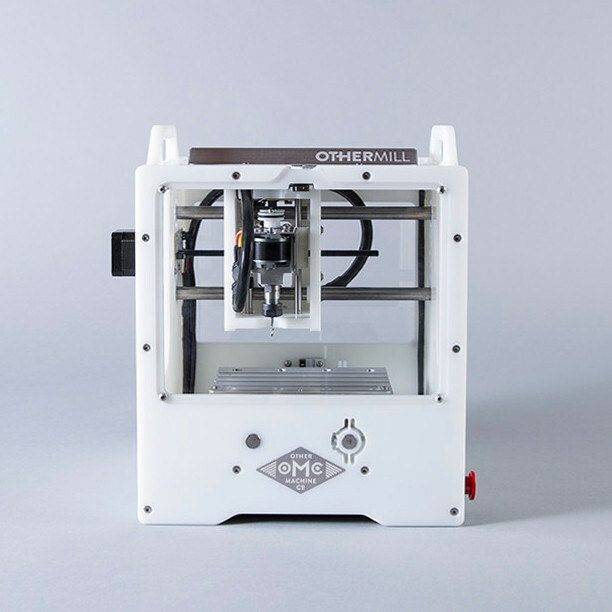 The Snapbot went on to inspire two tools in the portable CNC market—the Othermill—by Othermachine Co—and this very early version of the handibot designed by an intern at ShopBot named Matt Schmitz, using the same snap joints that Jonathan developed. After working with the snap joints for a while and talking to Jonathan about his experience with them, we agreed that they weren’t quite reliable enough in tension and that we’d have to go back to a screw joint. We found a ¼” nut that could be firmly pressed sideways into the plastic parts allowing us to drive a screw into the side of the panels that made up the tool frame. 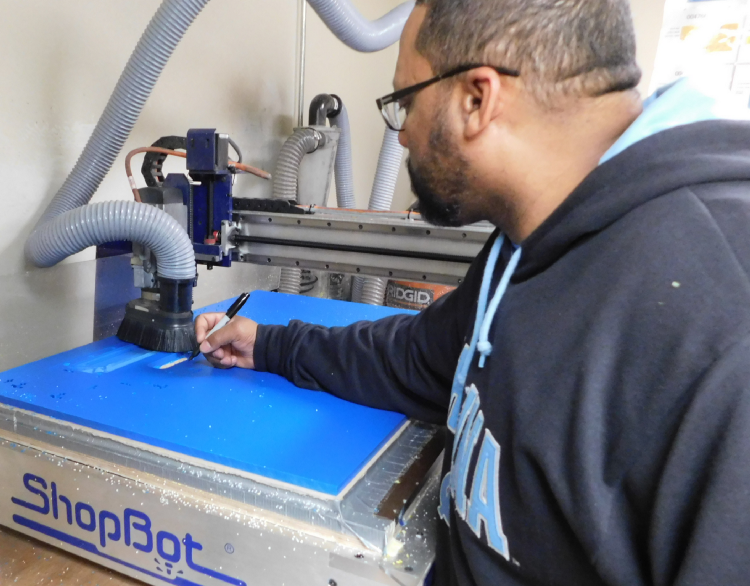 The tool continued to evolve—getting a color update to be closer to ShopBot’s preferred Duke Blue color. We also started to standardize what would be the Handibot’s core feature—the lack of a bottom! Rather than cutting on materials that were placed inside the tool—this tool would be placed on top of the materials that it was meant to cut. One solution to the problem of small tools only being able to work on small pieces of material. We then moved the electronics out of the cutting area of the tool where they were getting buried in sawdust and put them in a separate compartment of the tool that was sealed off from the business end of the tool by a plastic dividing wall and a little piece of bent aluminum—which conveniently served as a heat sink on which to mount the electronics of the handibot. We wanted to focus on frequently updating the tool as ideas came to us—but doing it in ways that our users could follow along—either making the new parts themselves or at the very least being able to buy them from us and install them on their own tools. As the community around the tool grew—we started to get loads of suggestions (mostly polite) through our forum—and at Maker Faires. 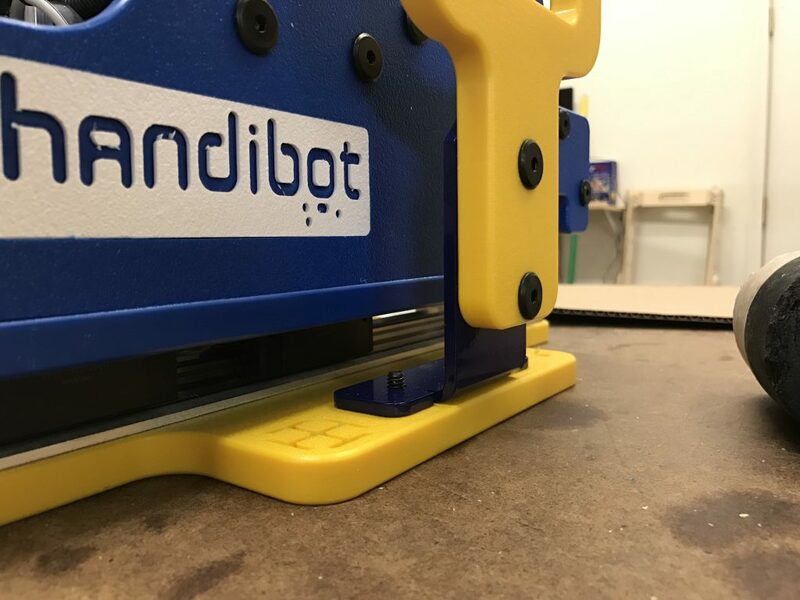 I had started working on the Handibot project then and I tried to include all of the requests in a new design—better dust collection, a more rigid frame, a simpler way to measure the length of your router bit, easier access to the work area of the tool—while avoiding some of the pitfalls that we’d encountered in the first few generations of the tool. I was also keeping the latest design always updated online where customers could download the plans themselves if they got tired of waiting for me to iterate on different ideas. So we eventually arrived at the current design—which still makes use of most of the off the shelf hardware from the original handibot—just reframed in a new plastic shell with some extra goodies included. 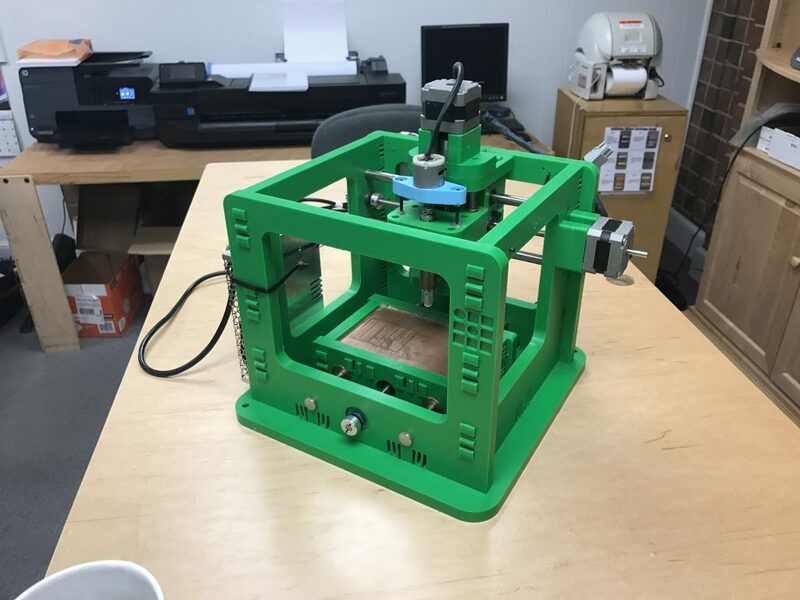 With a medium sized CNC router at your disposal, you’d be able to create all of the new parts that went into this tool—even the metal ones. This was when I first started noticing that the environment in which I was manufacturing the tool was one of the main guiding factors in the design of the tool itself. Because I was manufacturing all the parts—I’d look for ways to speed up the process so that I could get the next version ready earlier. Things like designing parts that only had features on one side—so that I didn’t have to flip parts around to different orientations to drill extra holes. Or finding the perfect type of hose for dust collection that could be twisted into a rudimentary thread that I could cut in the plastic wall of the tool. The bent aluminum back panel had to go—I didn’t have a press break to do the bend in my shop so I would have had to wait for an outside shop to make prototype parts for me. This effect was popping up in other areas too—packaging had typically been contracted out to another company that would design a custom die to cut out cardboard supports and foam padding—those boxes were delivered pre-assembled—and we didn’t have room for them anymore in our new, small shop! Not to mention the amount we had to pay up front to get someone else to make our packaging for us. We switched to buying a regular off the shelf cardboard box—and some thick sheets of foam. 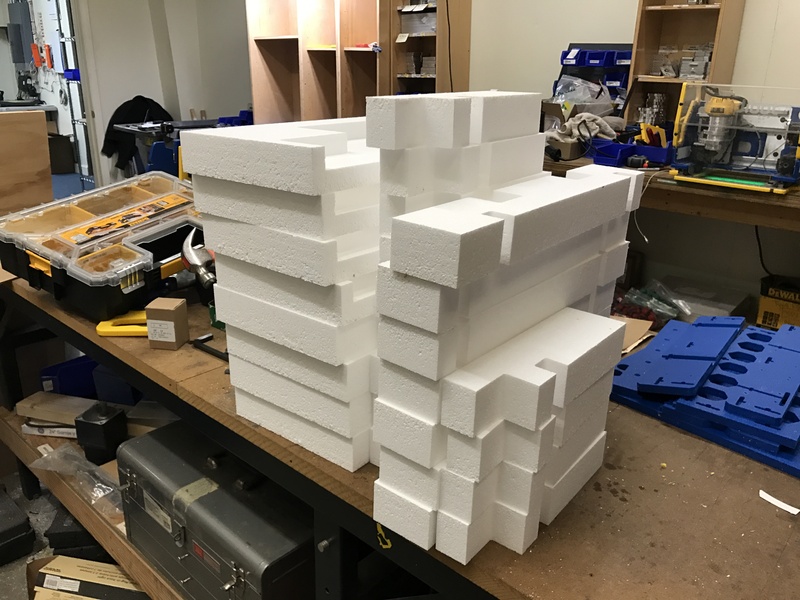 We could throw the foam on one of our CNC tools and cut out a pile of pieces that could be glued together to make full packaging for the handibot—but only as we needed it. 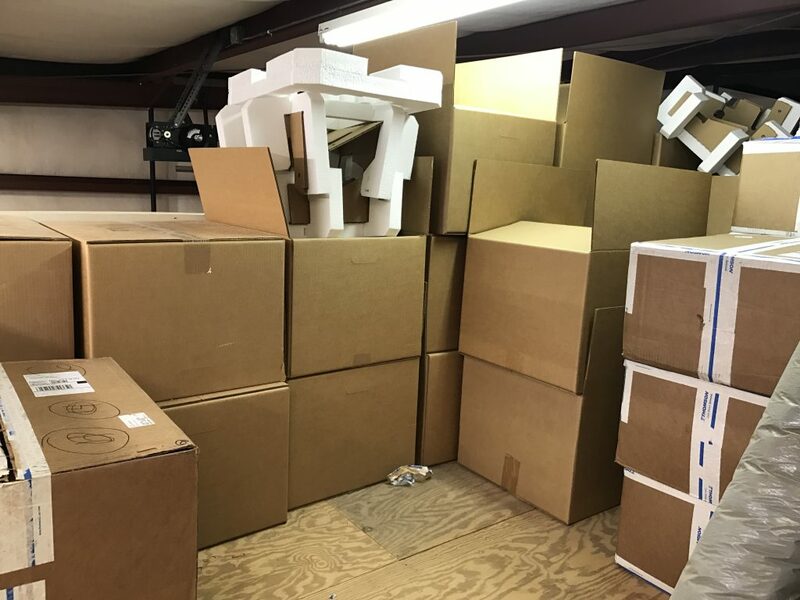 The rest of the time—the boxes would sit neatly folded and the foam sheets would be stacked flat in storage. This cut down the warehouse space for our packaging by 90%! We did run into one problem though that almost made us go back to the custom made packaging. The boxes that we could buy standard—didn’t include the little handle cutouts on the side for use in picking up the roughly 45 lb package. The box was small enough so we didn’t think it would be a major issue at first—but then we started to get photos from customers of boxes that had obviously been thrown or dropped and we realized that without handles, no shipper was going to bend all the way over to set our boxes down lightly. 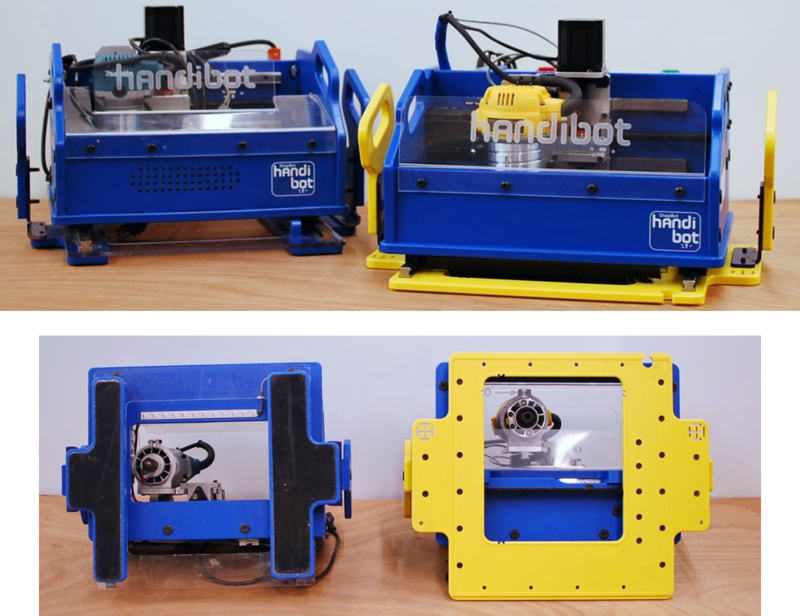 We still had a small fleet of old prototype handibots lying around the shop—and Ted, the owner of ShopBot, had the idea to put an exacto blade in place of the router on one of them and try to punch the handles out of the sides of our boxes. He built a table with a handibot on a hinge—where you can toss the box up into place and hit “GO” on the tool to punch out your handles—here’s a video of it in action: (show video). The way that we try to think about parts is that—one, we can’t afford any part that only we use—unless we make it for ourselves—and even better—our customers should be capable of making as many of our parts as possible using just the tools that they have. That’s why almost all of the parts for handibot accessories are designed to fit within the 6” by 8” cutting area of the tool. There is one part in particular on the handibot that I’d like to point out as an example of a “bad” part—and one that is exemplary of an older way of approaching manufacturing. This little blue bracket that holds up the handle on the side of the tool. It drives me nuts when I think about the tools required to make it—and the combined cost of owning those tools—both in dollars and space. 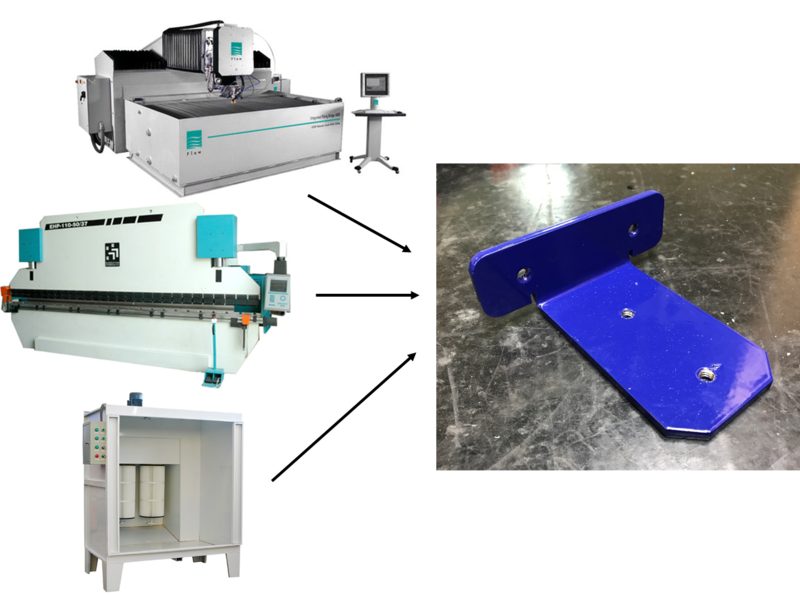 This one part requires a waterjet to cut the shape out of a thick steel plate…a press break to put the bend in the bracket…and a powder coating booth to apply the paint and protect the metal from oxidation. Probably over a $100k investment just to make this one part! So as we go forward—we hope to continue figuring out ways to make our parts with the tools that we have. This new version of the handibot—which is intended to make it easier for people to cut out shapes on large pieces of plywood—was designed with no new parts that had to be made outside of our shop. I’m hoping that as we all share our ideas for overcoming obstacles to small scale manufacturing—the small shop, lifestyle business will become more attainable and more attractive to people. I think that the small factory provides the kind of manufacturing jobs that we really want in our towns. When you’re working with a small enough group of people that you can have a real handle on what everyone else does and what their challenges are—then you tend to treat them with more empathy. 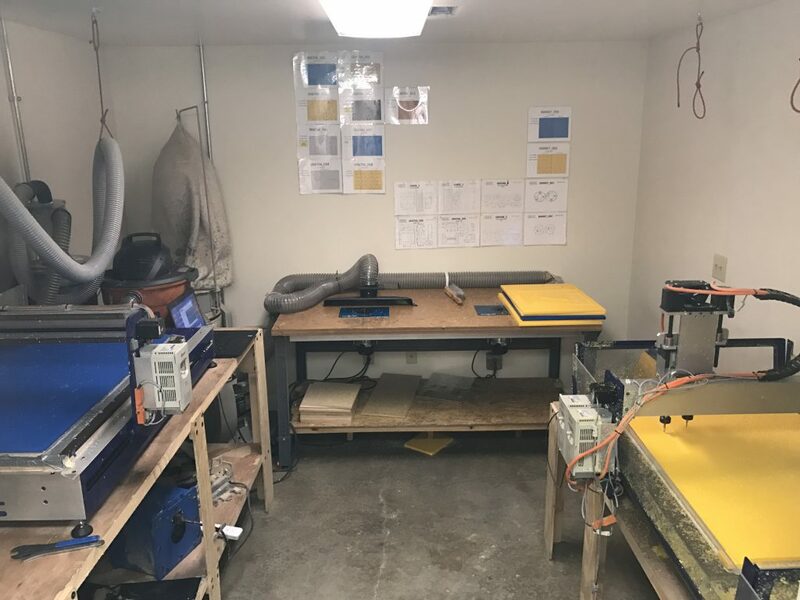 The golden rule in our shop is: “don’t ask anyone to do anything that you wouldn’t be willing to do yourself”—if something seems too tedious, dirty, or mind numbing…don’t inflict that on someone else just because they’re “a factory worker”—rethink your process and find a way to make the work engaging and stimulating. If I find that quality is suffering in some area of the tool then my first task is to find a way to make that step of the assembly easier for the person that is working on it. It shows that I think that what they’re doing is important—and it doesn’t point fingers. Of course it is may be motivated by my selfishness of wanting to work next to people with whom I share a mutual respect. A small operation will also inevitably force everyone to wear multiple hats. Variety in your work—spending one day building things, another finding an electrician to work on your lighting, and another travelling to a maker faire where you get to interact with the same customers that motivate the design of your product. I think that this is encourages ownership of what you are producing and makes the manufacturing operation sustainable. I experienced the perfect counter-example to this in my previous job working for a multi-national manufacturer that made car parts. One of my favorite stories from that job is about a throttle body that we were making for Honda Elements. (which is the car that I drive—that ironically has a faulty throttle). The throttle body is a motorized valve that controls how much air gets to the engine—you’d see a line of them out in the open on those old hot-rods with engines that poked out of the hood. This one had the problem of dirt getting into the actuator which would eventually jam the throttle and cause the check engine light to come on due to insufficient air flow to the engine. We had no idea—until an email from Japan informed us that a countermeasure had been designed—in the form of an additional plastic cover that we would screw onto the top of the throttle body. 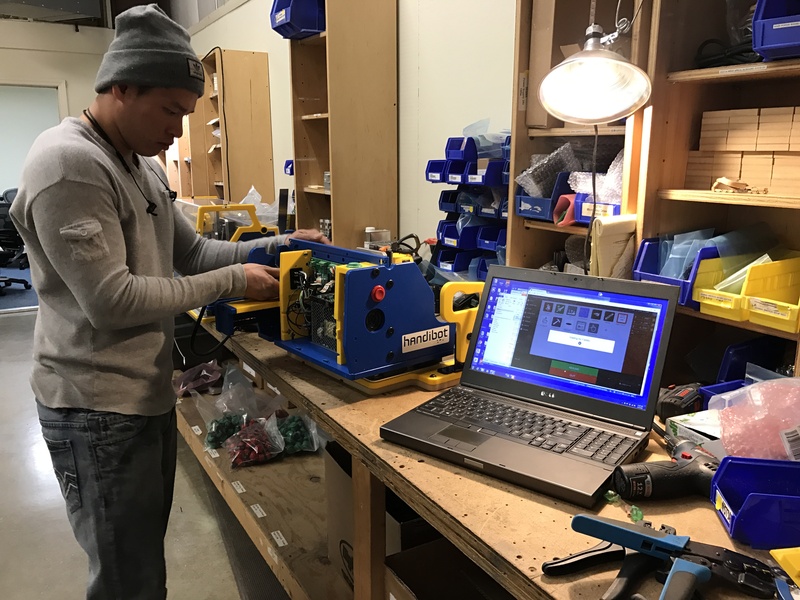 The cover was designed hastily and put into production right away—somewhere in china—and shipped to our factory in Michigan where it was to be added to the parts we were already building. The only problem was—when the first of three screws were inserted—the plastic cover would twist, making it impossible to insert the remaining two screws. In a large operation, gripes are rarely aloud to flow upstream—this is true to an even greater degree in a Japanese company…so rather than requesting a redesign of the plastic cover…we had to design a new tool that could hold the cover just so—and automatically insert the screws. Rather than making the part easier for a human to put together correctly—we were trying to force it to be impossible to screw up. I’ve got a short video here of the machine that we eventually came up with—and I feel so sad for the person that has to run it. He’d previously had a station with a power screw driver and a hopper of screws…now we can’t even trust him with a screw driver and he’s just required to stand in front of this box all day and feed it throttle bodies and plastic covers. 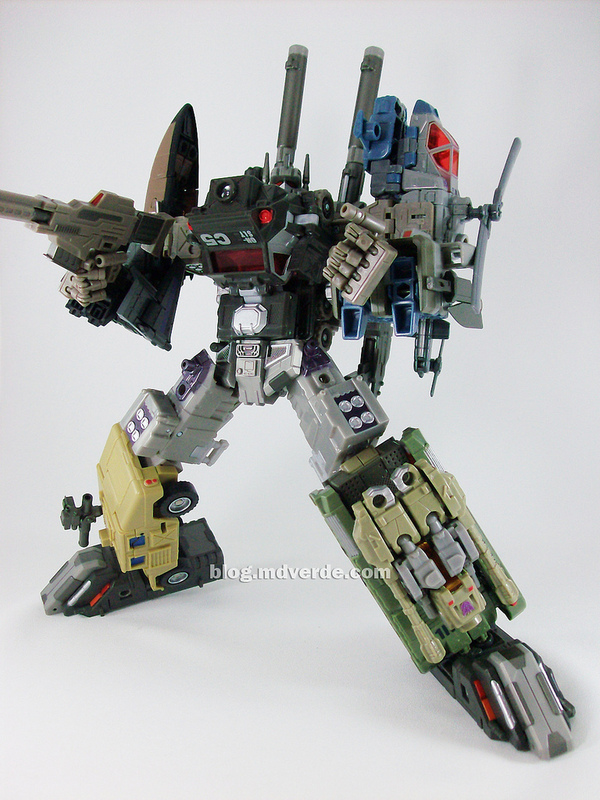 It even has an array of laser sensors to make sure that he hasn’t put the thing in backwards. What I took away from all of that was that I wanted to work in an environment that encouraged design that works for the customer, for the company and for the person that works on building it. 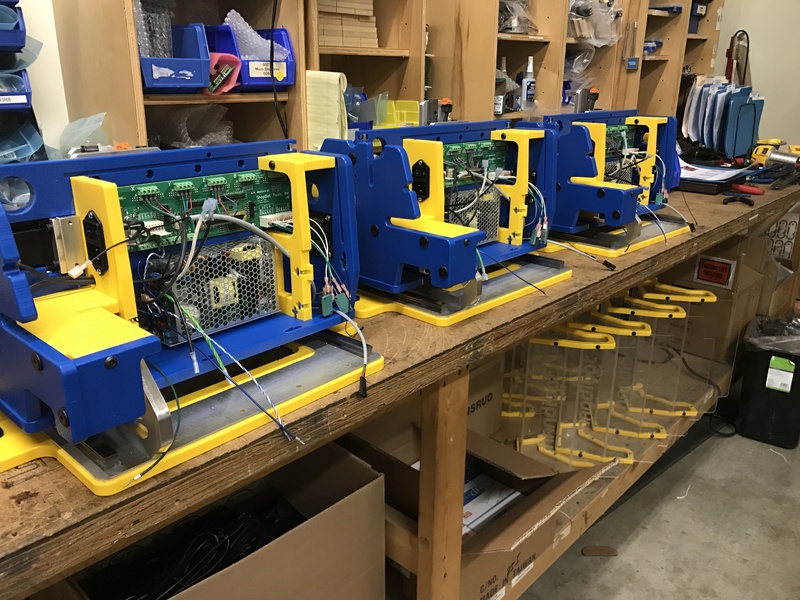 I think that what we’ve sort of bumbled our way into with our micro-factory is something that I hope will become more common as the types of products that consumers want shifts to things that we can manufacture in our garages. So what has to happen for more products to be produced in the micro factory model? Looking back at the earlier example of the imac flaunting its manufacturing as part of its design–we’re seeing more wooden products that display the design choices that make the parts CNC-able. 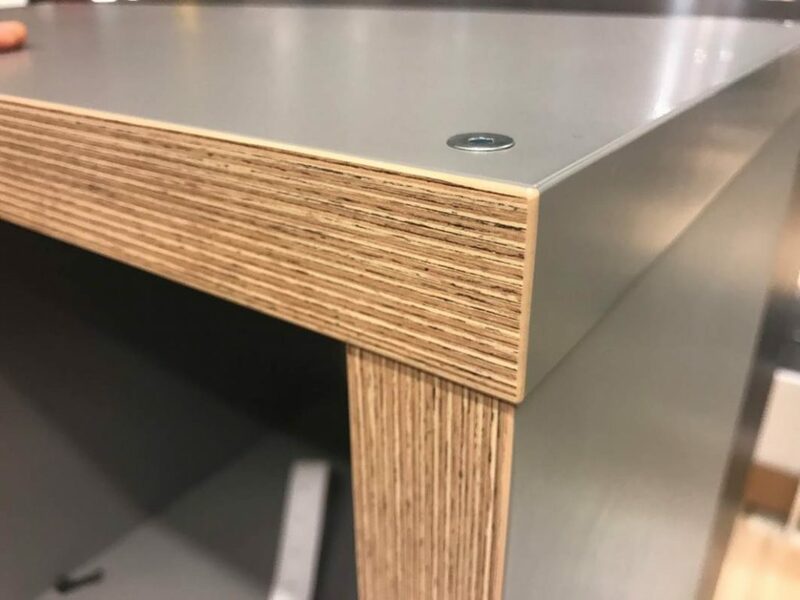 As more people design products in this way, the joinery and framing will become synonymous with high tech, local manufacturing. I was given hope that this shift is happening during a recent trip to IKEA. I was looking at some of their low end fiber board shelving when I noticed that the veneer on one of them wasn’t designed to simulate some exotic wood grain—but rather the edge of a sheet of birch plywood! 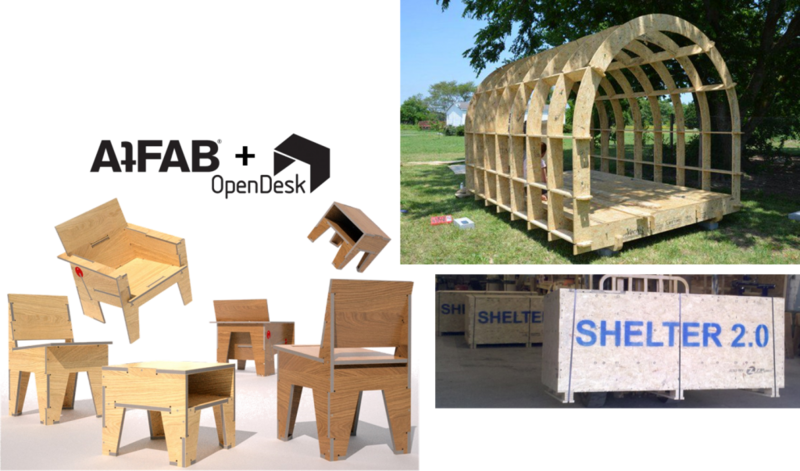 It had the look of a CNC cut piece of furniture that a group like AtFab would design. When catalogs are filled with pictures of items that you can build in your local makerspace—it might launch a 100k new micro-factories. Great read Brain, with plenty of insights. Inspiring story urges me to go positive and achieve big my power hand tools sites.